A playable demo of the game is also available at E3! 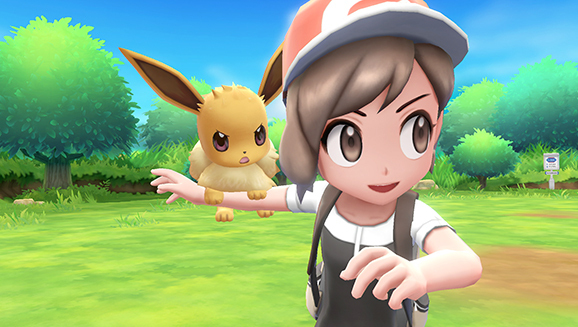 At the 2018 Electronic Entertainment Expo (E3), new footage of the next Nintendo Switch Pokémon title, Pokémon Let’s Go Pikachu and Eevee, was revealed. Check out the segment that played during the initial E3 Nintendo Direct below. 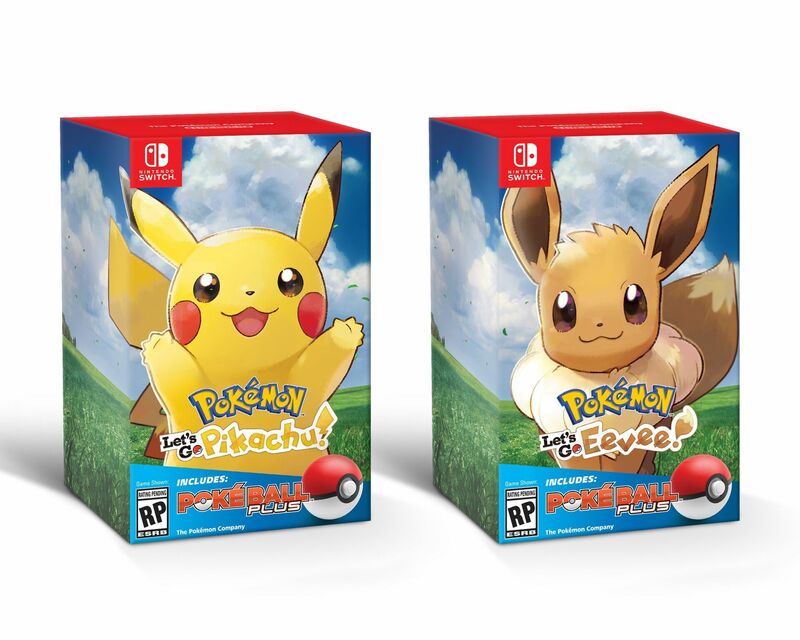 It was also revealed that the Poké Ball Plus accessory will come with an exclusive Mew for Let’s Go. Currently, nothing is known beyond this. There will also be a combo pack containing both the game and the Poké Ball Plus. The box art is as follows. A Treehouse Live segment showed gameplay, including Viridian Forest and Pewter Gym. Brock returns as Gym Leader, and the layout of the Gym is identical to previous Kanto titles. Reportedly, you need a Water or Grass-type Pokémon to access the Gym. The Rival character from previous Kanto games is gone and replaced by a character call ‘Trace’. He appears to be nicer than Blue, and also cowardly in nature. Battles and Trades online are friends-list only, which is in line with earlier news that the Battle Spot, GTS and Wonder Trade will be gone from this game. Happily, you can Nickname your Pokémon at any time, although this puts the Name Rater out of a job. Razz Berries return as in Pokémon GO and increase the chance a Pokémon is caught. Exp Share returns as well and grants experience points to all Pokémon in your party. You start with a large number of Poké Balls, but other types like Ultra Ball will be more limited in number. The ‘Following Pokémon’ feature returns and applies to all other Pokémon you catch, with some which are large enough being able to be rode around the world. Depending on the version of the game you get, a Pikachu or Eevee sits on you during your travels too. They can indicate with a wag of the tail if there’s a nearby item to pick up. Transfers from Pokémon GO are one way and are in an area that completely replaces the Safari Zone area in Kanto. Pokémon GO in return receives Candy for the transfer. You can also release Pokémon in Pokémon Let’s Go for Candy, which are used to increase stats – for instance, “Quick Candy” increases Speed. Thanks to Lost for notes from the Treehouse segment.